One of the greatest resources we have as educators is each other. 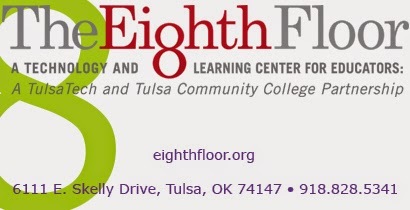 The Eighth Floor is a learning and technology center for educators. We focus on educational technology and its integration into classroom curriculum. Okay, so I have gotten a little behind on my blog posts. Dont's judge! Unfortunately, blog posts are the least of what I don’t have time for these days. It is scary how easily your time can be hijacked by budget cuts. For me, good professional development makes me think about what I do and how I can do it better. In the interest of time, I am going to bullet point this webinar for you. I am curious if anything stands out for you? Anything angers you? Anything motivates you? Me, I get excited and inspired by these ideas. Not true for everyone. 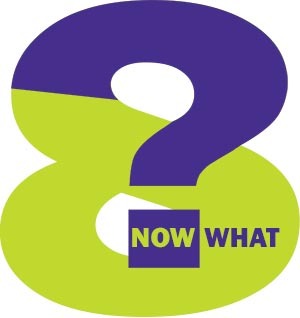 Assess/measure work based on the value of the work – what difference does this work make? 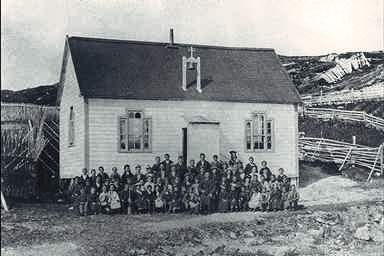 Before the early 20th Century there were not really grades in school. Everyone learned together and from each other. Big Shift! – Stop spoon-feeding teachers and stop spoon-feeding students. It kills awe and wonder and a sense of purpose. Teachers are working much harder in the classroom than the students are. And, who is supposed to be learning here? Teachers need to talk less and listen more – listen more to individual students - how else can you personalize learning? Don't let budget cuts change your mind about why you do what you do. You ARE making a difference. When I take the Myers-Briggs tests, I generally come out a pretty solid E – for extrovert. But I have to be honest, I have always questioned that. I think I am both an introvert AND an extrovert. It all depends on what I am doing. I have been reading a book that is making me think a little differently about this whole introvert vs. extrovert thing. 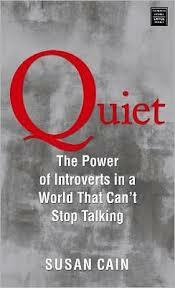 The book is Quiet: The Power of Introverts in a World That Can’t Stop Talking. Have you read it? Group work – gosh. It depends on the group. Group work and collaboration are such important skills to have. Because. Right? Most introverts don’t “take” to group work. It’s true. For them, solitude is critical to creativity. However, our classrooms are more or less designed in a way that makes everyone participate in some sort of traditional group work at some point. Our culture values the characteristics of an extrovert more, and thus we design our learning environments to achieve that. I am wondering. Can you think of a way to level the playing field for both kinds of learners? How might you integrate technology to do that? Here is a survey I am giving to a group of teachers tomorrow on this exact topic. If you have a minute, play along! It took three years to make it happen, but it finally happened. 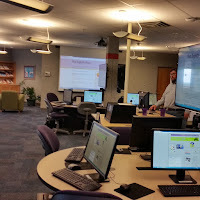 We have turned our Atrium classroom into a collaborative web of learning. It is a tangled web we’ve woven. I say that, but it is seriously cool. 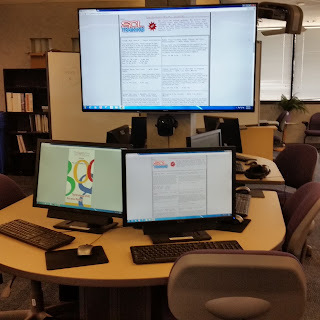 We have created nine “pods” where four people can work in individual groups Primarily, we wanted the TVs at each pod to be able to display what that group is working on. 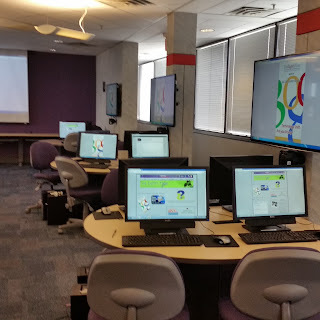 An added functionality is at any time, the TV screen at each pod can display the instructor’s computer or any other student’s in the room. It’s not magic. We have to poke on some buttons every time we want to change displays, but all in all, it works pretty smoothly once you get the hang of it. There is going to be a learning curve for us and our participants, but that’s okay. We are already working out what we need to do to make that more of a bump than a curve. Personally, I think the biggest challenge is going to be ours as instructors in this environment. The possibilities are endless. This configuration promotes more active and engaged learning. It also allows for more personalized/small group instruction. Exactly what we wanted!! However, as educators, I am sure you guys know what that means - lots of work. We need to get busy figuring out how we can change how we run our classrooms and how we can put participants in the driver’s seat more. We’d love to hear any ideas, tips, or suggestions. No. Really. We would. Enrollment is open for summer. We have some great stuff going on during June and July. 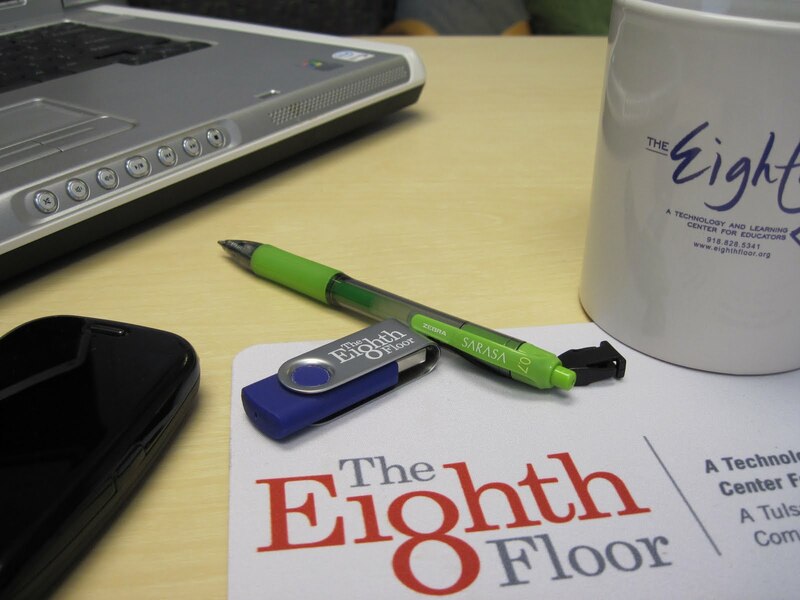 Eighth Floor Open World - Reignite the Passion. Wednesday June 17th. This is an all-day conference full of workshops, pop-up topic discussions, prizes, refreshments, and you. Open World is designed for all of our consortium members. Regardless of what or who you teach, there will be opportunities for you to reignite the passion for both you and your students. Synchronous Online Learning . . . Training. Our NOT boring version of the boring webinar! Our sessions have "SOL" Just sayin'. 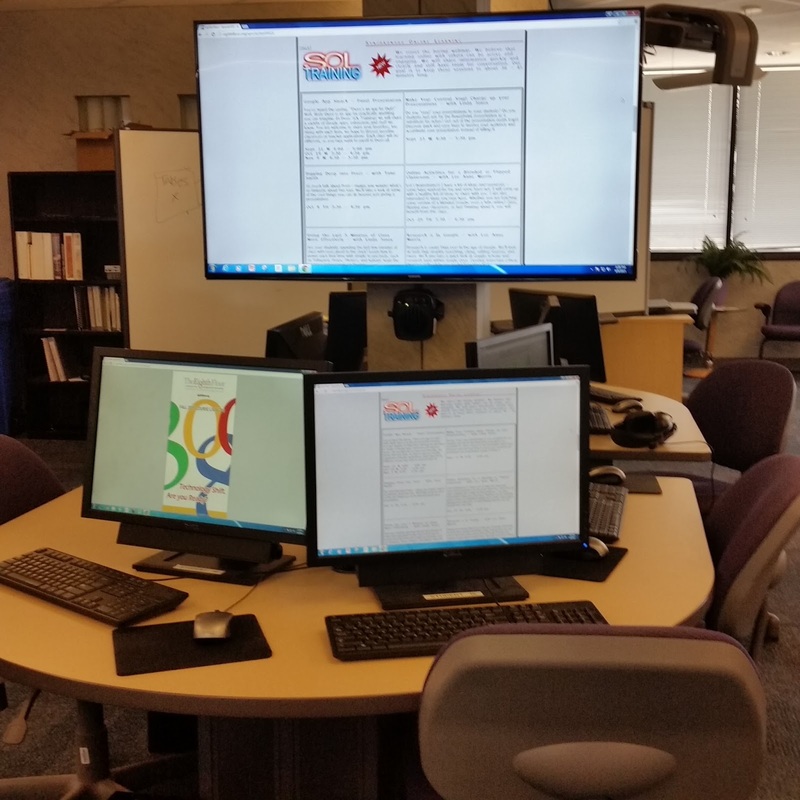 We will have several scheduled throughout the summer, for those that want to do their learning from home. 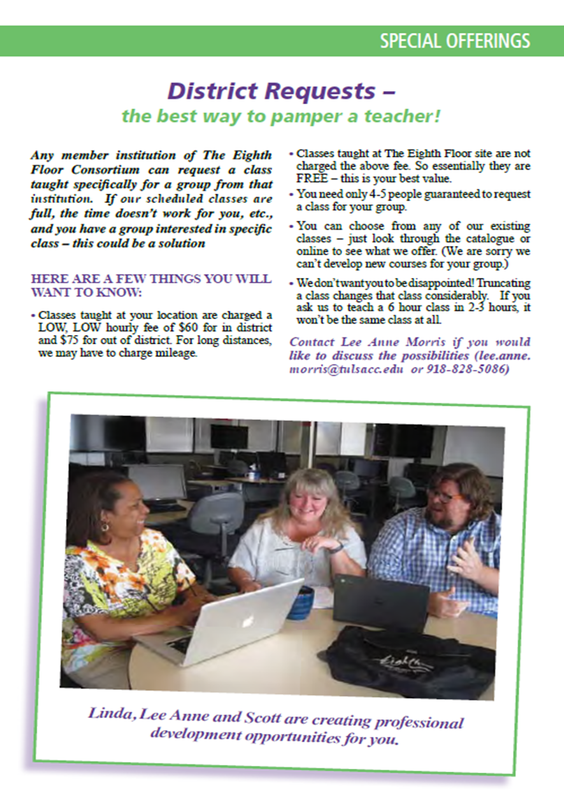 I certainly don't want to leave out our schedule of established online, blended, and F2F classes. We are looking forward to learning with you this summer. Since the holidays, it has certainly seemed like the tale of two semesters for us at The Eighth Floor, both perfect and problematic all at once. Between snow days and the flu and the coming of spring allergies and storms, we have managed to fit in a few classes unaffected disaster. We have had more hurdles than usual. There were several weeks when I was starting to wonder if we would ever get more than one or two days of classes going without having to reschedule everything. On top of the weather issues, we have worked around conferences, our own mini flu epidemic, weather – you get the idea. Complication. Frustration. Life. On the other side of that, however, are the teachers. It may be that every class I have taught this semester has been remarkable. Not a clunker in the bunch! No, I don’t mean because I am just that awesome – I mean the people coming to our classes are just THAT AWESOME. I have met some great new teachers, new to us and/or new to teaching. We also have a solid core of people who take every class we offer – love these people! My classes have been full of educators who are ready to do the work. Some of my very best classes have been a perfect reflection of what The Eighth Floor does best – bring together teachers, kindergarten through college, who listen to each other and help each other. I may have worked harder at my job this semester, but I have appreciated it the most. I am tightening up the summer schedule – just taking a little break with this blog post. I am looking forward to another fast, furious, and fun summer. And thanks, but I'll skip the "worst of times" next semester. Hope to see you in class, soon! I want to spend my days a little less frantically. 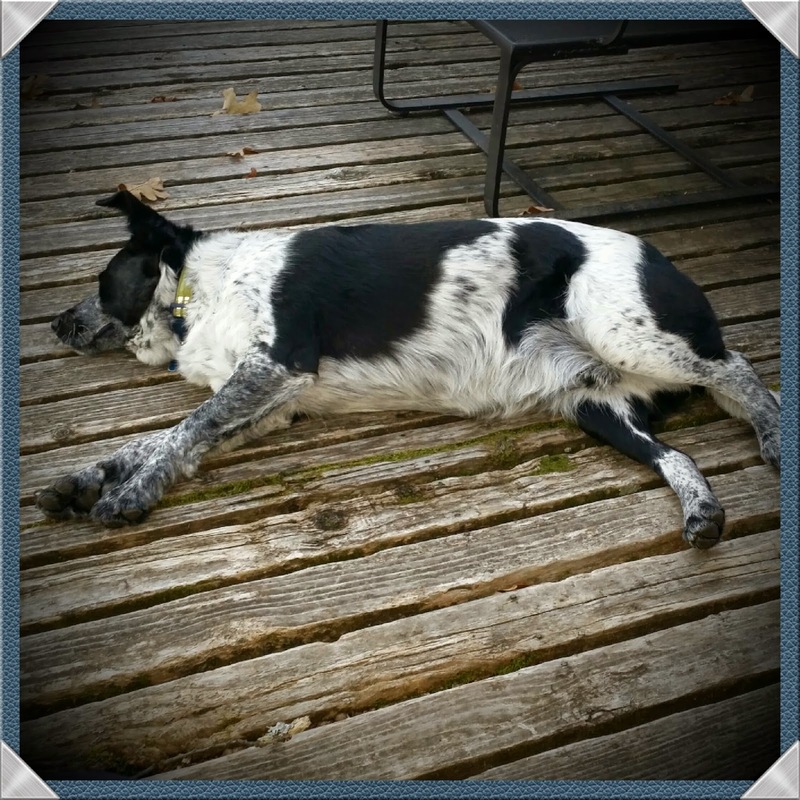 J.J. keeping calm on the deck at the lake. My inspiration. I hope to direct my intentions towards that end with a fresh year, fresh semester, fresh realization that I am pooped – not making any resolutions. And, I would like to sleep more! So instead of drilling down on a checklist of stuff I gotta do, NOW, I have started my semester trying to step back and take a big picture look at what we are doing here. I think I have been overly focused on trying to keep up with the educational trends and trying to keep things fresh and new with blood dripping off the edge. That’s ridiculous. Not even possible. In that fog I have forgotten to keep exploring the important questions with the people who take our classes, the essential questions. Why is it so problematic, so much of a struggle to integrate technology into the curriculum, the classroom, education in general? Given that technology is a square peg we are trying to fit in the round hole of our students’ learning, should we even be making this effort – is this worth the change necessary or is it just another buzzy trend? WHY? What will have to change for technology to have the impact we think it should? How might you respond to these questions? 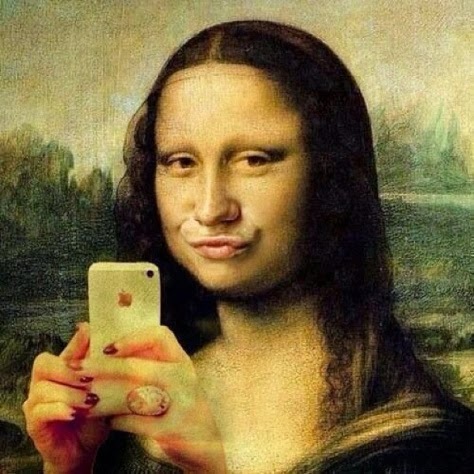 Millennial Narcissism? I think not. I love my students, but gosh. I am so frustrated right now. Are your students prepared for class? What does “prepared for class” mean when you say it? Does that mean the instructor has prepared everything for the students for class or the students have come prepared to participate in class? Whose job is it, this students being prepared to participate in class business? I thought it was a combined effort – I do my part and they do their part. I am starting to figure out that I am just plain stupid wrong. I’m expected to do all the work here. 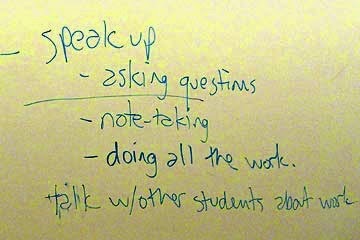 Over the past few years I have grown increasingly frustrated with student participation in class. I’ve never had trouble with good class discussion. So, I have been thinking they are just unwilling. Unwilling to do the work. Unwilling to put themselves out there. Unwilling to care. You get the idea. Unwilling. This semester has been the worst. Why? I really want to know. I have been thinking about this quite a bit. This can’t be a simple case of millennial narcissism. Why do they not take notes? Why do they not read or watch videos before class? Why do they not feel any obligation to participate in their success? 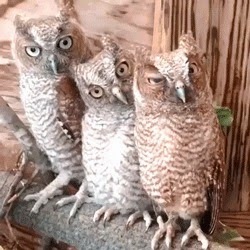 I ask a question and they stare at me. They don’t even bother to look down at their notebooks to avoid eye contact. Guess why? They don’t have any! What is this note taking you speak of? -- I can see them thinking it. At one point it had become so ridiculous I just gave up. After a series of questions about a video we had JUST watched (because they did not watch it on their own as was assigned) and nothing but blinking eyes looking back, I asked how many in the room were breathing. Blink. Blink. I then asked how many were no longer breathing. On that one I got three blinks. I think I confused them with math or philosophy or whatever. So, I have been trying to do some reading, been trying to figure this out. I know that I am going to have to change my approach, as I doubt they will change theirs. Honestly, I have tried a variety of approaches. Nada. I am wondering if this isn’t the end of class discussion as we know it. This is a blended class. We have tried online and F2F discussion. They are mildly better at the online approach, for obvious reasons. Here’s the deal. I am starting to think they are just not ABLE to participate. If they can’t memorize it, then they don’t understand what learning is. If I haven’t provided a work sheet or study sheet, they don’t know what notes are. But by golly, they BELIEVE they will be successful. I don’t want to sound like I am beating these hopeful people up. I love my students. I really do. I think they are wonderful people, and I want nothing more than to be a guide to their success. No sarcasm intended. I just feel like I am not getting them there. I also feel like every few years I have to lower my expectations one more notch. What am I missing?????? I can find all kinds of articles about millennial narcissism and helicopter parents and a grand sense of entitlement, but I think there is more to this. Do you? Is Information in Danger of Losing Its Value? I tell ya, I love how the universe can be “just in time” just for me every once in a while. This morning am sitting in my office thinking about a conversation with my students last night, and along comes this post from TeachThought: Teaching Google Natives to Value Information. It found me. Really. The author discusses so many of my frustrations - not sure that's the word I want to use. In class we were talking about memory. How do you remember information for a test? 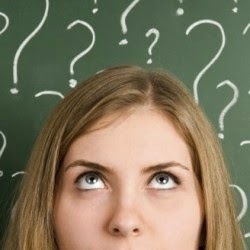 How do you know to memorize information that you need in order to learn more information. These are first semester freshmen – just to let know – they know everything already, so I often wonder why I am even there. The start of the conversation was on test taking, but then we wandered into the whole availability of information and how we can just “Google” what we need to know. If we know how to search better, we can find anything we want to know. I have huge, huge concerns about credibility and relevance. Huge. Helping students develop the nose for credibility and the skill for evaluation is not easy. We can give them all the check sheets and examples we want. I still feel there is value in just knowing some things, even things I can look up easily and be pretty sure the information is right. I do like author's list at the end: 10 Strategies to Encourage Digital Natives to Value Information. Good list. BTW - I am teaching "Better Internet Searching" tomorrow from 4:30 - 6:30 pm. Still room! District Requests - Having Classes Your Way! We see them everywhere, infographics. They are a tool that uses visual design, text, and research (we hope) to organize ideas, sell something, teach something, basically communicate. They blend words and pictures. Remember picture books? Remember Powerpoint, Excel graphs? Infographics (and tools like them) are a digital, online iteration of this kind of communication. 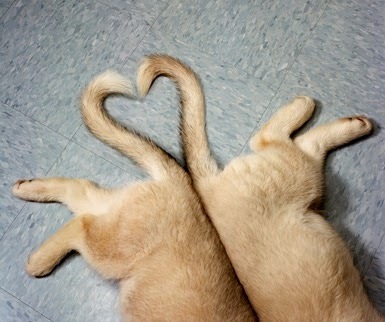 I like them. I like the challenge of trying to "write" in a new environment, one that employs all my 21st Century skills, such as they are. I like the opportunity to communicate and stimulate with colors and shapes. It's fun. But as cool as they look, their deliberate simplicity is deceptive. Have you tried to create one? I have. I've tried hard. I'd rather write an essay. When I first started playing with infographics, the tools were complicated and clunky - unless you were prepared to pay for the next level up. The next level up was, of course, where all the "front-page" templates were. Templates make things much easier. They make your work look on the screen how it looks in your mind. I was not prepared to give up. I kind of let the whole infographic universe stew for a while. While it was stewing, new tools came along, techniques became more defined . . . I found ways for this to make sense in a classroom with students at any level. So NOW, I am ready to do a class on infographics in the fall. I've dabbled a bit as part of my research and learning process. You may have caught the SOL Training I did last spring on Infographics or the workshop session I did at Eighth Floor Open World this summer. They were fun, and I have learned a little more about the technology and technique each time. More and more I come across someone who writes well about this medium. For example, this post in Edutopia, Inventing Infographics: Visual LIteracy Meets Written Content. I come across insights and application like these and I get excited to teach my students something new, something more relevant. Come play with me this fall! We'll play with colors and pictures and words and create things that are remarkably sophisticated! Follow us by email - type your address here and click "submit"
You'll be Jumping off Bridges in no Time, Too. When we say “Online Class” – What does that mean to you? WHO IS 'HOGGING' THE INTERACTIVE WHITEBOARD IN YOUR CLASSROOM?